We are a support group and charity in UK and Ireland concerned with the rare genetic condition aniridia – which causes a lack of irises (the coloured ring) in the eyes and poor vision from birth. 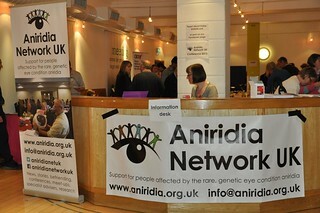 Since 2001 Aniridia Network has been helping people with aniridia as well as their families, doctors and teachers to be: hopeful, confident, supported and well informed about aniridia and related issues. Learn more About us. Become a member to benefit from all our services and stay in touch. A chance to hear from and ask questions in person to people interested in aniridia. Find out about our events including the next Conference in Birmingham and the last Conference in London plus the annual Aniridia Day. Watch the videos of the fascinating sessions at our past events. Membership: Join our network to get or give more support. Support us: Your help is vital so we can make a difference: volunteer, donate or fundraise. About aniridia: Details of the causes and consequences of aniridia and the related medical conditions.